Preheat your oven to 475 degrees. In a large bowl mix your olive oil salt, pepper, and garlic powder. Add the potatoes and coat them well with the mixture. Place the potatoes in a casserole dish leaving as much mixture as possible in the bowl. Bake the potatoes for 1 hour, making sure to flip and mix the potatoes every 15-20 min. While the potatoes are baking coat the chicken in the remaining mixture and cook in a skillet over medium heat until done. Once the potatoes are done, remove them from the oven and reduce the oven temperature to 400 degrees. Add the chicken, cheese, bacon, and green onions. Put the casserole dish back into the oven and bake for 5 minutes or until the cheese is melted. Top with sour cream or Ranch dressing. Serve and enjoy! 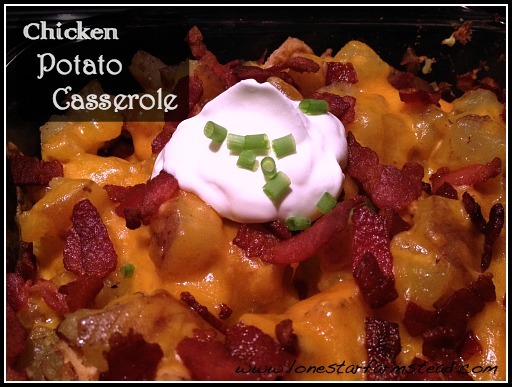 A delicious, loaded potato spin on a chicken potato casserole. As a side note, we cook our bacon in a cast iron skillet and then cook our cubed chicken in the bacon grease in the cast iron skillet. Really gives the chicken that extra pop. If you can't or don't want to prepare fresh bacon, bacon bits or real bacon bits could be used but I would only add them at the end with the sour cream topping. You know I spend way too much time on Facebook when I spend a ridiculous amount of time searching for the “like” button in this post LOL. Great! Let me know what you and your family thinks. This has officially been husband and baby guy approved. My son even ate the potatoes, which is something he normally only eats deep fried.